Development | Nichi-Iko Pharmaceutical Co., Ltd.
Nichi-Iko develops “Premium Quality” drugs, based on six development strategies, in the Global Development and Quality Control Center it calls the “Honeycomb Building.” Based on the concept of “Quality creation begins at each development stage,” our technical staff always strives to develop drugs using our unique and innovative formulation techniques. These techniques, in terms of ease of administration (size, flavor, etc.) and of usability (ease of handling, ease of identification, disposability, etc. ), were developed from the viewpoint of users, including patients, their families, and medical professionals based on a wealth of technical information and experience. 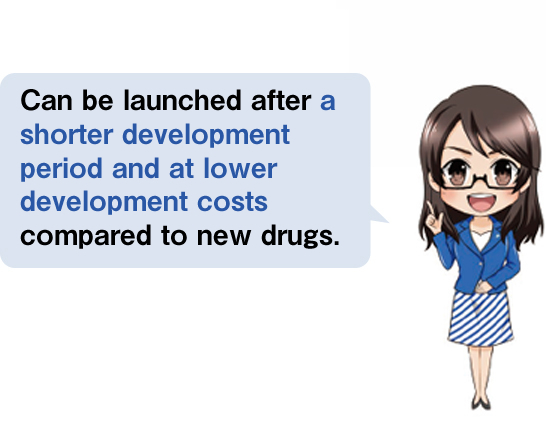 Generic drugs can be launched in a shorter development period and at lower development costs compared to originator drugs (new drugs). 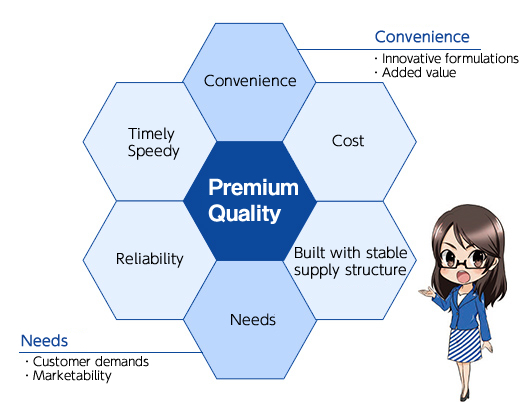 However, many processes described below are required up to the launch of the generic drugs. Generic drugs can be launched only after the re–examination period and expiration of the patent of their originator drugs, among other things. The Development and Planning Department conducts such patent searches as well as selects candidate items for development while taking into consideration marketability and other factors. The selection of drug substances is of utmost importance in manufacturing high–quality generic drugs. 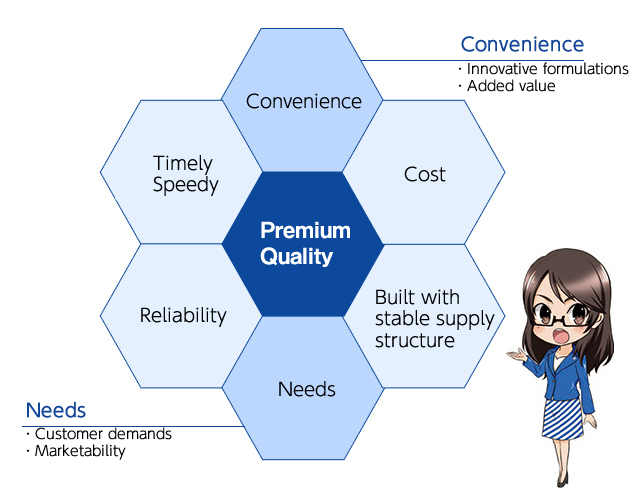 At Nichi–Iko, we use carefully selected high–quality drug substances that can be obtained in a steady supply from several manufacturers in Japan and abroad. In considering formulations, we not only aim at formulations that are equivalent to the originator drugs, but also repeatedly perform trials as well as consider packaging materials to incorporate innovations in formulations for patients. After considering various factors and determining the dosage form, we manufacture investigational drugs with a view to obtaining the necessary data for drug approval. The approval of generic drugs as medications by the government requires that stability studies be conducted to confirm the efficacy and safety of the medication. The Product Test Department has established an appropriate analytical method (testing method) to conduct quality assessments of various tests of drug substances and formulations. In addition, the Product Test Department conducts dissolution test that compares the dissolution characteristics of active ingredients to confirm the equivalent quality of originator drugs and generic drugs. The approval of generic drugs as medications by the government requires that clinical tests be conducted to check the efficacy and safety of the medications in accordance with national standards. The Clinical Test Department confirms the process of active ingredients being absorbed in the body and disappearing from the body (pharmacokinetics) when a human takes an originator drug and a generic drug, for the purpose of checking the generic’s equivalent efficacy and safety compared to the originator drug. It is an extremely important mission to continuously provide a steady supply of medications to patients and medical professionals. Production Technology Department provides technical support for the production of drugs manufactured at each plant and contributes to the stable supply by considering the scale-up of production up to a commercial scale. To ensure the reliability of the application dossier to be submitted to the government examination body to obtain approval of a generic drug, an audit is conducted by an organization that is independent from the department preparing the application dossier.